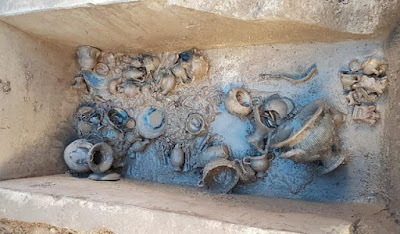 Sewerage works in Muro Leccese, a small town in the province of Lecce, in the Apulia region of south-east Italy, led to the discovery of an intact Messapian tomb containing the remains of several children and their funerary goods. According to archaeologists Oda Calvaruso and Francesco Meo from the University of Salento, the tomb dates from the Hellenistic period, between the fourth and third centuries BC. "This is the first time that such a deposit has been discovered with vases, bowls, toys and feeding bottles, still intact. It is an invaluable discovery because it was found in an area of the ancient necropolis and testifies to the importance of Muro Leccese in the Messapian era."